They are simple lists of items to save, sell or buy at a vendor. The items can be specific to a character or set to be active for all characters. The advantage of Vendorizer is the it is designed around a simple drag-n-drop method of setting up items in the lists. There is no need to know item ID numbers or anything about the item other than to pick it up and drag it to the appropriate tab. 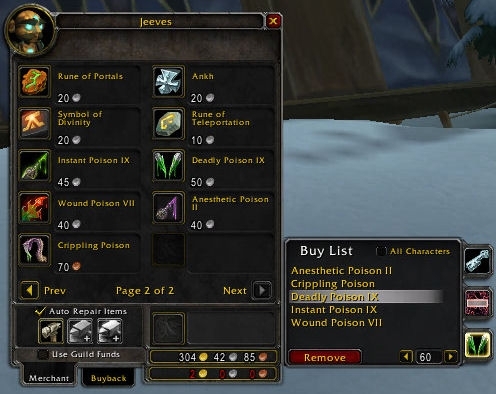 Added the ability to drag items from inventory to the buy tab. Updated for WoW 4.0. No real changes. Fixed an issue with the profit/loss line not calculating correctly. Increased the buy list input box to 5 numbers. More small fixes. Everything seems to work 100% now. Added an option to choose if to auto-repair with guild funds. Moved the profit/loss frame to accommodate the guild bank repair option. Another small fix to the buy tab. A small fix for the sell tab as well. Fixed a small bug with the buy tab. Fixed the auto-repair option not being placed correctly when the guild repair button is showing. I keep getting the same bug maven79 is getting, which breaks the auto repair part of the addon for some reason. So if you're having problems auto-buying items that appear in a stack at the vendor, comment out the lines as above and it's done! Specifically, I have Tome of the clear mind on my restock list, any vendor I open who sells that Item gives me an error. name = "Tome of the Clear Mind"
(*temporary) = "attempt to perform arithmetic on field '?' (a boolean value)"
I'm having a problem where the addon refuses to buy listed items or repair from certain vendors. For instance from Jeeves. I added 'Tome of the Clear Mind', from the jeeves vendor, and it will not replenish it, or repair my items. I've tried clicking off and back on the toggles. no luck. Looks like I'm getting two errors. I did supply a value to re-supply to (20). But when I open the window after a reload or relog, the value is empty. If I select another item, then reselect the tome, it says 20 at the bottom, but doesn't recognize it. If I select the '20' and hit enter, it then works fine, until i reload or relog. Last edited by bschieltz : 10-31-12 at 03:54 PM. With so much transmog fun my wife's equipment manager is filling up with sets. She recently sold some gloves that belong to one of her transmog sets. I was looking to write a small add-on that does just one thing, prevent the sale of equipment set gear, but your add-on handles everything vendor related so nicely that I decided to ask you first. Do you think it would be too hard to add an option to the save list to save all equipment sets and have the list auto-update any time an equip set changes? Is there even an event for that? I figure if the right event is available the best approach would be to have a separate equipment save list, to avoid clearing a saved item that was manually marked for saving and then in the save implementation parse both save and equip lists. thanks for such a great add-on. The addon still seems buying items from vendors that the vendor sells as stacks incorrectly. The fix mentioned below still works (though the line number has changed), but while you're updating the TOC for 4.3, it would be nice to have this fix officially put in. While I'm commenting, this addon has, by far, the best interface of any of the vendor autobuy/sell/repair addons out there. It looks like it's part of the default WoW interface. I overlooked adding that fix into my local build. This is do to Blizzard using Glob style matching rather than a more exact matching system. It might be possible to code around, but afaik, there is no way to be certain you have an exact match, so... Yeah. Don't put things in the list by name unless they're also restricted by another value. It's kinda something you should know about for anything you do; if you were king Fortune Tellers and there was a Fortunate Soul you shouldn't attack, if you were typing '/target Fortun' will get both of them. It's just worse when you have something named 'Ancestral Coin' and 'Gold Ancestral Coin'. If you're trying to match 'Ancestral Coin' there is no way through name matching to not match 'Gold Ancestral Coin' as well. Thanks for the report. 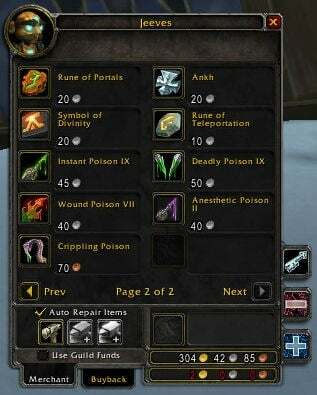 Vanishing Powder is new and I think Blizzard has changed some other small things about vendor items. I will check it out. EDIT: I even added the mysterious to save list and it still sells them. Last edited by Sintacks : 02-21-11 at 06:35 PM. I was having the same issue with dragging the item to the sell/but/save window list giving me the dialog if I am sure I want to destroy the item. I figured out what I was doing wrong. Still would be nice if the add-on supported the difference. Here is what is going wrong. 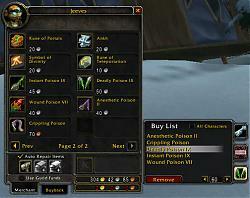 In the blizz interface we are used to click and item in inventory and the item becomes bound to our cursor. We then carry this item and place it in a new slot or action bar by clicking the spot to place it. This action as it turns out is NOT dragging an item . For this addon to recognize the drag, you must actually drag the item. That is click and hold the mouse button on the item you select and do not release until the cursor is over the button for save/sell/buy. This will add it to your list . Hope this helps other users. I've found this addon to be of great help to me. I had not previously used the save list feature as I mostly depended on its auto sell grey items. But with the imminent archeology price changes, I'm using the save list quite a bit. After all every little bit of gold helps . Is this on a non-US client? I think this may be a miscommunication about how to use the mod. At first I thought you had to drag the items to the tabs while they were open. It took me a little while to realize you were supposed the drag to the icons for the tabs. You should probably support either one actually. I play in Australia, and I think that uses the US client as well. "dragging an item to the buy/sell areas added by this mod simply asks me if I am sure if I want to destroy that item"
Still happening on 4.03 live, no other addons enabled.